I consider this the healthiest meal I make. 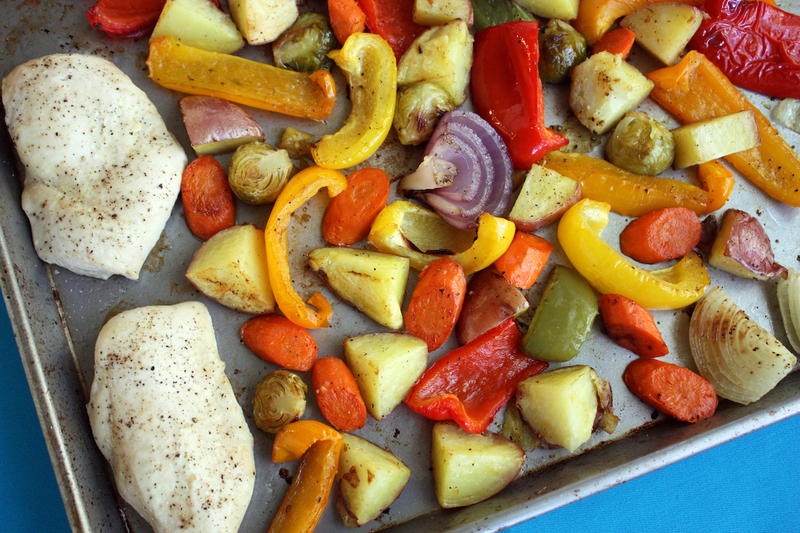 My one pan chicken and roasted vegetables is quick and easy and healthy. Vegetables are the lifeline to good health and roasting them brings our their sugars so the browning combined with their sweetness makes them super delicious. Then the chicken is lean and low fat because I use skinless, boneless chicken breast. The chicken provides high quality protein and all those veggies? Well, it’s like taking a vitamin pill only better because vitamins from real food are much better absorbed than any pill. Every meal I make starts with whatever vegetables I have on hand. That’s because vegetables are loaded with antioxidants, vitamins, and minerals essential to good health. Each color of veggie has its own set of benefits so when you mix and match the colors, you get a huge array of nutrients. I make roasted vegetables at least once a week, sometimes served with just a can of sardines, sometimes with pork loin, but this is my favorite way to serve them. 2 Comments on "One Pan Chicken & Veggies"
I love a recipe you can put together in one pan. My kids like roasted veggies better than other ways and i am making this for them. I already tried your meat loaf and it was a winner!! I’ve been using your recipes from you tube for years … I especially love the fall off the bone ribs and us it frequently …. but I just thought you were an exceptionally cute woman that can cook like nobody’s business…. kinda my personal girl in the kitchen to help me out…. now I find out your some kinda celebrity bigshot fancypants … and tons of other people already love ya too … my smitteness is plummeting… but I still love ya … thanks for a lot of great recipes …and bein so cute ….Merry Christmas to you and your family.